Analyze feature now allows you to create new calculated measures directly in your insights. Use items from the Measures section and basic arithmetic functions to create new measures for your current insight. If you need to analyze data from you insights in other applications, you can now export insights from Analyze tab to XLSX files (with merged or unmerged cells) or CSV files. Voice conversations are now split into more granular segments that help you analyze transfers between queues within customer contacts. For more details, please check the updated article on Conversation Structure. An additional set of built-in metrics and reports now provide insights into such contact centers KPIs as SLAs and Handling Time. Navigate to the Queues and Handling Time dashboard tabs in your Control Center dashboard to check the updates. You can check the most recent full list of built-in objects in the attached file: WFO Metrics, Attributes & Reports. 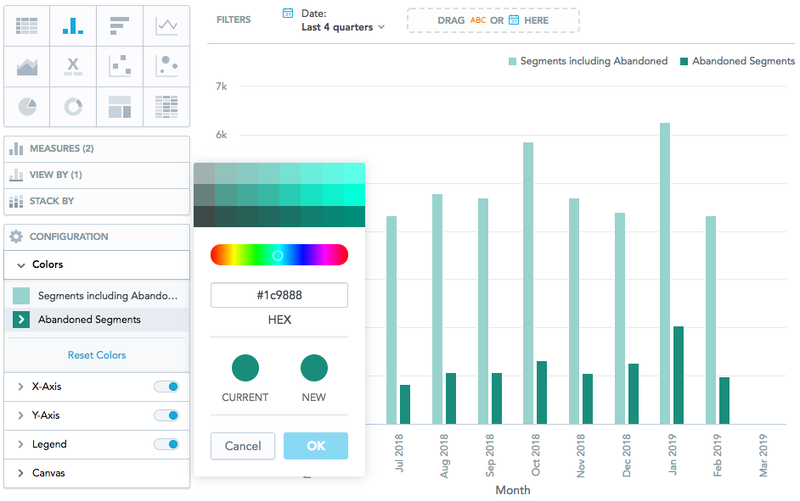 In the Analyze tab, you can now adjust any color that represents measures and attributes. You can select from a predefined set of colors from the color palette, choose a new color in the color picker, or enter a hexadecimal code to use your custom color. If the insight is included in a KPI Dashboard, the new colors are displayed there as well.